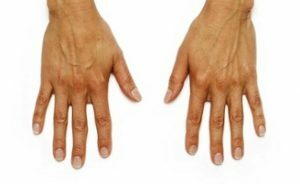 Looking into Hand Rejuvenation? If you answer yes to any of the following questions, hand rejuvenation using dermal filler may be the treatment for you. 1) Do your hands show prominent or pronounced tendons or veins? 2) Do you have lost volume in your hands? 3) Have your hands become thin skinned and wrinkled? Dermal filler for the hands is a minimally invasive procedure which takes only 30 minutes to complete, and provides plumping effects almost instantly with results lasting up to one year. An added benefit is that it can generate collagen production, which can subsequently reduce the amount of filler you need for future treatments. Plus, it is mixed with lidocaine, an anesthetic, which minimizes discomfort. The side effects are minimal, but can include temporary swelling, bruising, pain, and itching. There is no downtime after the procedure and you should be able to return to your normal daily routine the day after the procedure when the anesthetic and swelling have subsided. As with all injectables, the procedure is performed by Dr. O’Rourke. Brown spots on the hands can also be treated with IPL, a light based technology device. Call us now for your complimentary consultation with Dr. O’Rourke to see if hand rejuvenation is for you.